Experience an aromatic cleanse with Panier des Sens The Absolutes Precious Jasmine Perfumed Soap, a triple-milled soap born from the traditional expertise of master soap makers in Provence. 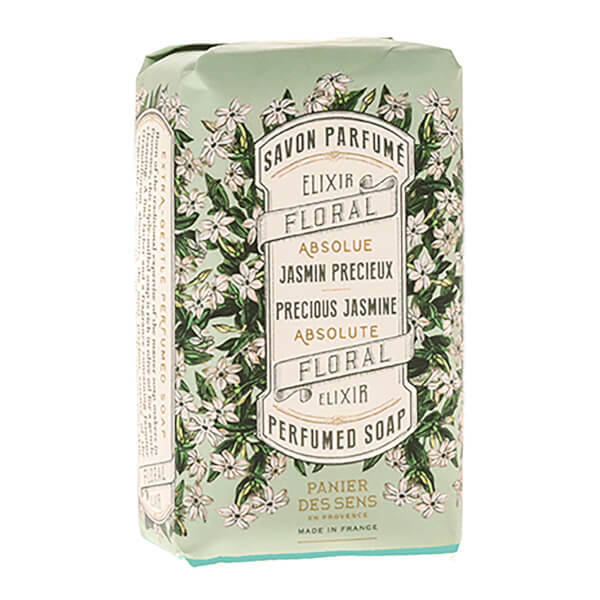 Rich in Olive Oil and the powdery, slightly fruity fragrance of pristine Precious Jasmine, the extra gentle soap delivers a delicate cleanse, working into a fine lather to leave skin feeling purified, pampered and perfumed. Formulated with 97% natural origin ingredients. Sodium Palmate, Sodium Palm Kernelate, Aqua (Water), Glycerin, Palm Kernel Acid, Sodium Chloride, Tetrasodium Etidronate, Olea Europaea (Olive) Fruit Oil, Rosmarinus Officinalis (Rosemary) Leaf Extract, Helianthus Annuus (Sunflower) Seed Oil, Parfum (Fragrance), Ci 77891/ Titanium Dioxide.